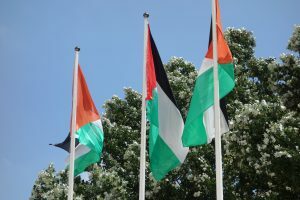 Archive by category "Palästina Blog"
Dear God, may the sun always be on your face and the water above your head. May you be sure on all decisions you have the possibility to take and may your feet be free in their way – so you can go to take all chances! May the melodies of music keep your smile and positive mind always up and may your voice always find the space to raise when you think it´s time for it. May you have the calm and peace to look back and recognize traces of improvement. And until we meet again may god hold you in the palm of his hand. Over the last 12 day we learned a lot about each other and ourselves. Those experiences and memories will stay with us forever. We will always remember our new friends. In life there are a lot of ups and downs. We shared a lot of them. We laughed and danced and sometimes we cried and fought. The most important thing is that we did it together. Dear god we want to thank you for all of this. Afterwards we had lunch and an emotional goodbye and the the bus arrived and we had to leave. In the m orning we started taking the bus to Bethlehem and visited the organisation „wings of Hope“, wich works with traumatized persons in palestine. It was very interesting to hear about the work they are doing and the traumas that are caused by the political and cultural situation. 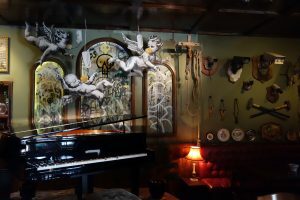 Afterwards all of us decided to visit the Banksy museum and hotel next to the Wall in Bethlehem. 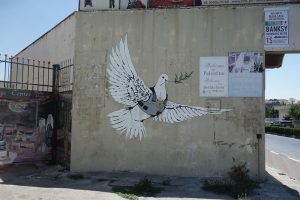 Visiting it was a really special experience, it was a museum full of the history of palestine and banksy´s drawings and graffities. The building is full of paintings about peace and the deep hope for freedom. Once again it was showing the need for solutions to the conflict so that the „city of Peace“ (Bethlehem) is no longer devided. Afterwards we went shopping for two hours and then we had free time to talk and a party in the evening with our favourite games. After a great night in our guestfamilies, where we enjoyed the possibility to sleep longer than throughout the last days, and where we had a delicious breakfast and arab lunch we all met again in Talitha Kumi. From there we started our hiking trip to the valley of Battir. We walked through the fantastic nature of Makhroor to learn about fields where the Romans used to grow plants by building irrigation systems and terraces, some of them still existing today. We could finish the hike nearly without any casualties, still the whole group worked togehter to get everyone to the village of Battir. 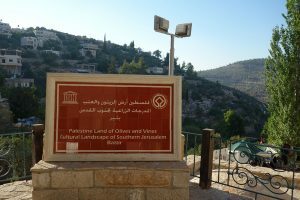 While some of us really enjoyed walking and would have wanted to go far further, others where really happy, that we took the bus back to Talitha Kumi after a short stay in Battir. After a wonderful dinner (as always in Talitha) we ended the day with some fun games in the evening. Because of us having breakfast at 7:30 we had to get up early. After breakfast we drove by public bus to Jerusalem, where we first went to the western wall, there we saw a jewish festivity. Afterwards we went to the Al-Aqsa Mosque on top of the Temple Mount. There we were told, that not only the buildings are mosques, but the whole Mountain is holy and all of the small openair buildings are mosques. The next stationon that day, was also the second station on Jesus´ way to his crucifixtion, so the Church of the Condemnation, here Jesus first picked up the cross an put it on his own shoulders. After that we followed the Via Dolorosa to the Church of the Holy Sepulchre. In the church are many relics of different christan groups, because of the different groups arguing over responsibilities, they gave the key to a muslim family, which has kept it for generations. After lunch we had free time to go through Jerusalem by ourselfs. In the late afternoon everyone went to his or her guest family. There we spent the night. Some experiences we want to share from that are: a beautiful views of Beit Jala or Jerusalem from rooftops, good food and playing fun games. After our second night at Tabgha we woke up early to have breakfast and pack our stuff. We really enjoyed our time there together and saying goodbye was really hard. Three and a half hours later we arrived in Hebron, where our first stop was a traditional glass factory. Back in the bus we started our citytour, which was interrupted by a short lunch-break. By foot we continued our tour and went to a rooftop, where we had a first glance at shuhada street, a part of the city palestinians are not allowed to enter. We also visited Machpela, the mosque in Hebron and learned a lot about the situation in the city. Hebron is divided in two parts, H1, the palestinian part and H2, the Israeli part. 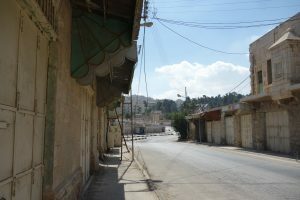 Closed off walls, checkpoints (there are 22 of them) and soldiers are part of the daily life of the inhabitants of Hebron. On top of that they have to deal with the settlers who are basically allowed to do everything without consequences. The presence of the military is very aggrieving. There are around 2000 soldiers for 500 to 800 settlers. Later some of us wanted to take a closer look at the shuhada street while others visited the synagoge. The street once was the heart of the city and now it feels like a ghost street. 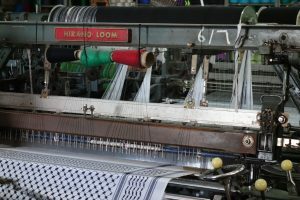 Before going back to Talitha we made a final stop at the last factory that produces keffiyeh, the traditional palestinian scarf, in Palestine. Our first night at Tabgha was very nice. Those who woke up early were able swim in the pool to wake up properly. After breakfast we started another church rally. First we went to the beatitudes church which has a very beautiful architecture. The flowers in the garden and the awesome view made it even more enjoyable. 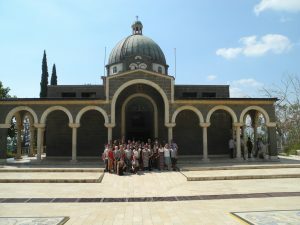 We also went to Caphernahum (the town of Jesus) and Saint Peters church. It was very touching to see the places where Jesus lived and bulit his church. After lunch and another jump in the pool we went on a boat ride on the Sea og Galilee. We put on some music, had fun and danced together. When we reached the middle of the lake we stopped the music and the engine of the boat. We gathered and listened to the bible verse in which jesus calmed the storm. After that we stayed silent and thought about the bible verse. It was very relaxing to take in the atmosphere and enjoy another breathtaking view. Then we went to Taghba where Jesus fed 5000 people with 5 pieces of bread and two fish. In the evening we had a special service. Everyone was involved in it. We prepared the decorations, prayers and songs. Also we were able to take part in the preaching. We are happy and feel peace within ourselves, got rid of stress and hope to take this feeling with us when we go back home. We started our day by leaving Talitha Kumi at 7:55. We drove to Nazareth. We visited 3 churches on our way, the first one was built on a place where Maria saw an angel who told her that she will be pregnant. Then we walked through the old city and visited the synagogue church after that we went to the basilica of the annuciation. It was a big church. 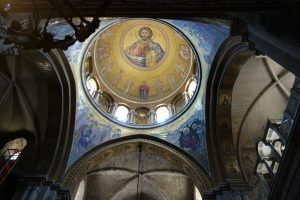 It has 43 national mosaics of Mary. Then we drove to the jumping mountain. There we had Manakesh for lunch and we enjoyed the panorama view. It was amazing so we took many photos. 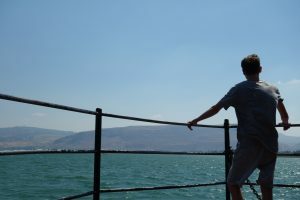 After that we arrived in Tabgha, next to the sea of galilee. Some of us swam in the sea and the others swam in the pool. In the evening a few of us prepared the dinner after that we had a big meeting, we talked about our positive and negative experiences. 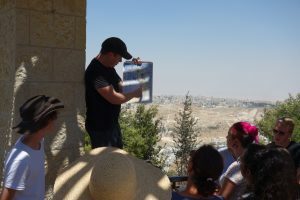 Today we had to get up very early after a short bus drive we visited a service at the church of the redeemer, then we went on a trip with a guide of ICAHD through east Jerusalem. He told us, what the isrealian goverments official reason for building a wall in a completely different place than the border from 1976 is. But seeing all the illegal settlements, hearing about them and the weird location of the wall makes clear that there can´t be a good explanation for all of that. And he told us some things about the organisation he is with and that they stop the destruction of palestinian homes. Inspite of all these bad impressions we had a great party because of Anna 18th birthday. And birthdays have to be celebrated! Today was a day full of several diversified emotions. with us the problems faced by this school being built in an industrial area where a lot of loud noises and bad smells are present. We also had to remember how important education is for new generations. Because it needs a lot of strength to not reply to the conflict of their reality with anger. Around noon we went to visit the graveyard of the former president of palestine which had several symbols all around to resemble the palestinian reality,such as the 3 palestinian flags raised to its side as a reminder of the 3 official funerals he had held in each of France, Egypt and Palestine as well as the moving water in the shape of the letter U used to resemble his movable cascket to explain that one day his wish of being buried in jerusalem will be fullfilled. After that we were taken to visit the great arabic poet Mahmoud Darwiesh in which we also got to see his graveyard and his precious belongings and creative accomplishments.It was impressive how incisive and intensive the words of this man seem. 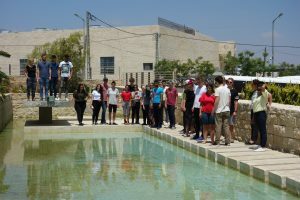 Of course after we saw all these interesting facts we were taken to he city center in Ramallah to see how life inside the so called economical capital of palestine is. After such a long,loud, crowded day in a city like ramallah we had to get through the checkpoint again. 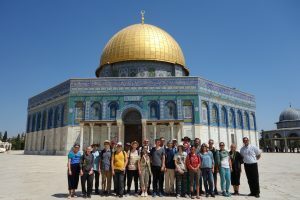 A large portion of our group decided to join the palestinians for support and to gain the experience of how the reality of their lives actually is. And in comparison to travelling outside of the country to any other different country we go through security checks but as for the palestinains they are forced to move from one city to another in their own homeland through checlpoints full of obstacles. As sad as this may seem I was very surprised by the mix of emotions that the people were going through and by that I mean fear, anxiety, patience, hope, anger, sadness and recklessness. Three hours of constant humiliation because of the low method of behavior used by the Israelis towards the Palestinians and in this case also us Germans delayed our way back to Talitha. For some it took more time to realise what happened than for others. Just because of the kindness of the Talitha Kumi Team we were having our delayed dinner. Instead of having to spend almost 30 mins to cross a usual checkpoint, we spent 3 long hours waiting for anyone to let us through. Finally after everything we’ve experienced during only 1 day. The best way for us to face what we saw was to end our day with a simple prayer just outisde between the calming trees of Talitha Kumi. Finishing this with a hug and starting something new with another one as well. The day began very early and we headed directly through a checkpoint to Jericho. 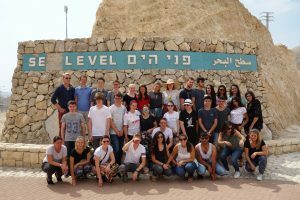 It was very hot and we reached the Sea Level, we saw the desert and the Israeli settlement too. In Jericho we went for a 15 minute walk to buy some fruits, and the bananas it´s known for. After that we walked to the tree of Zacharias, and we discussed his story. Then we went to the mountain of temptation, where a church was built. We had a very beautiful view, because the church was built very high, so we were able to see Jordan. After that we got hungry, and went to a restaurant, where we ate delicious food, which was maqluba (upside down). 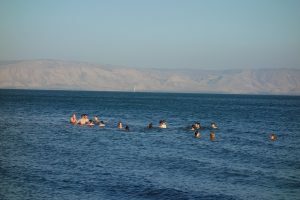 Finally we went to the dead sea, where it was too hot. We swam in the sea, but also in the pool. After this long day we came back to the hotel with a sunburn on most of the group. In the evening we ate dinner, and played games and ended it with a prayer.